A first Virginian long run beat up the birdlegs, despite all of that hilly mileage conditioning on the SWCP. Nineteen miles to loop around the south and then north banks of the James River. There are two excellent foot bridges that cross the water from downtown: the flat, slightly-bouncy-when-you’re-running Potterfield from Browns Island, and a more humped one directly under the Belvidere Street bridge to Belle Isle. On this occasion I took the latter, snaking across the island to join the excellent and mildly-rugged Buttermilk trail heading west. I then joined Riverside Drive through Westover Hills, a quiet, but winding road with a fair few blind corners to navigate, and then had the worst road section of the day, luckily short, on Forest Hill Avenue, crossing above the Powhite Highway. There’s no sidewalk, not much of a shoulder, and not really anywhere for the runner to avoid the four lanes of speeding traffic here. I kept to the left, which seemed the slightly less egregious side of the road to be on, and had a fair old wait to cross over when I needed to. There’s no obvious alternate route to avoid it to keep following the river west. I turned north as soon as possible to wind through a quiet residential area of Willow Oaks and, after a wrong turn or two, made it to the car park and trail head in Pony Pasture, a small waterside park with short loop trails, kayak put-ins, and fishing points. First through the woods, and then back on to Riverside Drive right by the riverbank, this section made for flat, pleasing and speedy running. One has to keep a close look out for a right turn onto the Huguenot Woods Trail further west to maximize off-road run time. This path leads a short distance under the Huguenot Bridge and to a parking lot where Riverside restarts once again. I looped south and then north to cross over the wide concrete expanse of the bridge to recross the river. A wide sidewalk on both sides of this bridge, I’m happy to report. Remaining on the lefthand side of the bridge road, there’s a narrow, unmarked, gravelly trail called the Gambles Mill Corridor according to gmaps. I sought that out to run north alongside a country club golf course, and then swung right and east along the top of the course on the start of the return journey back towards downtown. There are then a number of options to pass through the residential neighbourhoods to the east of the University of Richmond. I spent some time along Grove Avenue before snaking southeast on a few fairly uncomfortable, uneven, bricked sidewalks through Windsor Farms. There is probably a more foot-friendly route through here somewhere. Heading as close to the river as possible, I then crossed the Powhite again via Douglasdale Road to meet Maymont Park. 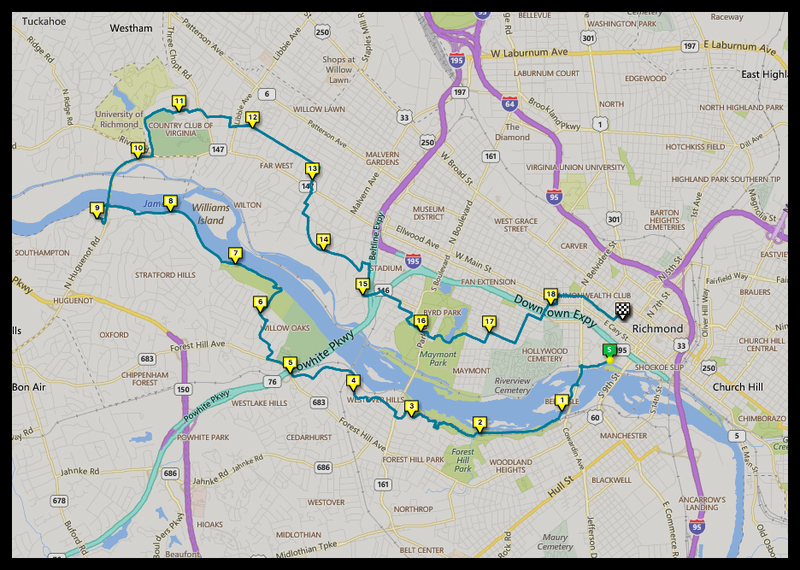 One could then either head for the North Bank Trail or up through Byrd Park, but I somewhat randomly chose a street route due east and north of Hollywood Cemetery, and then up to the main VCU campus, turning right towards downtown. Overall: a varied and interesting long training run. A few places are a challenge due to the proximity of heavy, fast-moving traffic and no pedestrian spaces, but the trail sections make up for it. Street running on the northeast side of the river was generally no problem and not a million miles from similar sections of e.g. Queens in NYC. Sadly there doesn’t appear to be a way to avoid that short section on Forest Hill Ave. if one’s heading west to the south of the river.